Looking for a beautiful yet practical bathroom design? 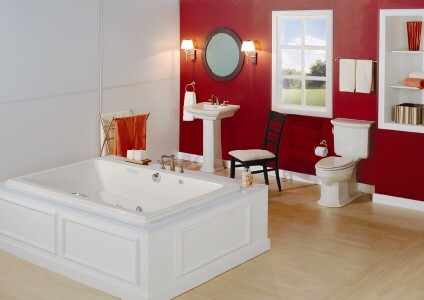 The Barrett Suite Collection from Mansfield plumbing might be the perfect solution to your bathroom décor challenges. This warm and inviting bathroom design is equally at home in traditional and contemporary home environments. This lovely bathroom suite features clean lines, smooth surfaces, and all of the conveniences of modern bathroom design. Much of what makes the Barrett Suite so appealing is a feature that isn't even visible in the room. The toilet has a concealed trapway, which is actually among the most highly sought after features in modern plumbing. The concealed trapway toilet enhances the visual appeal of the room, and also offers the convenience of being very easy to clean. collection, with the new concealed trapway toilet, is a classic style choice filled with architectural details. The Barrett Suite Collection has been expanded to include a concealed trapway elongated ADA toilet pedestal lavatory, drop in lavatory, and bathtub with many available features. For more information, see www.mansfieldplumbing.com or call 877-850-3060.